I just love these vintage Calatrava watches with the integrated bracelets. 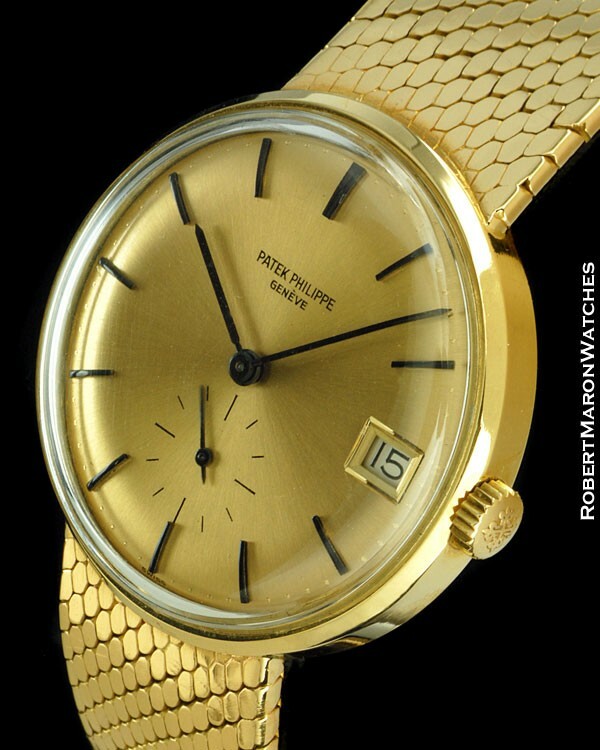 This watch is the reference 3514/4 in solid 18k gold, round case, with wonderful integrated solid gold mesh bracelet and stunning original gold dial with black markers and hands. 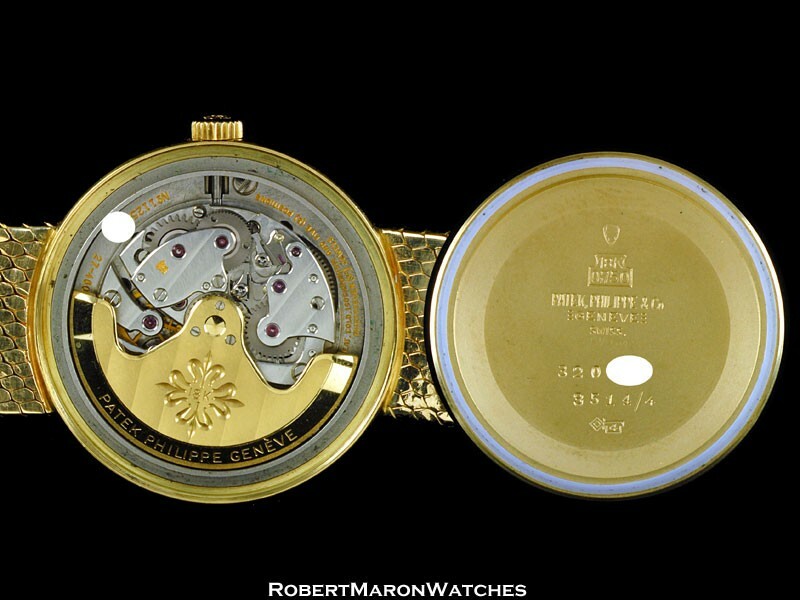 Patek also put one of their all-time greatest automatic movements inside as well, the Caliber 27-460M which is protected by the massive 18k screw down case back. 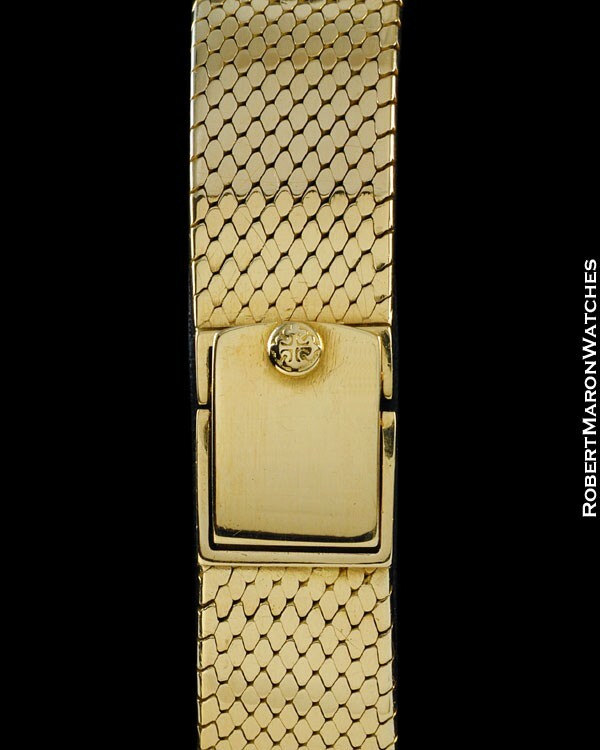 Case is mint solid 18k gold with dimensions of 34mm diameter by 11mm thick. Crown is signed with Calatrava Cross. Generously domed plastic crystal gives this watch a real vintage look. Bracelet is integral to the case and is a fine mesh weave with Calatrava signed clasp. Watch will fit up to a 7.25 inch wrist. 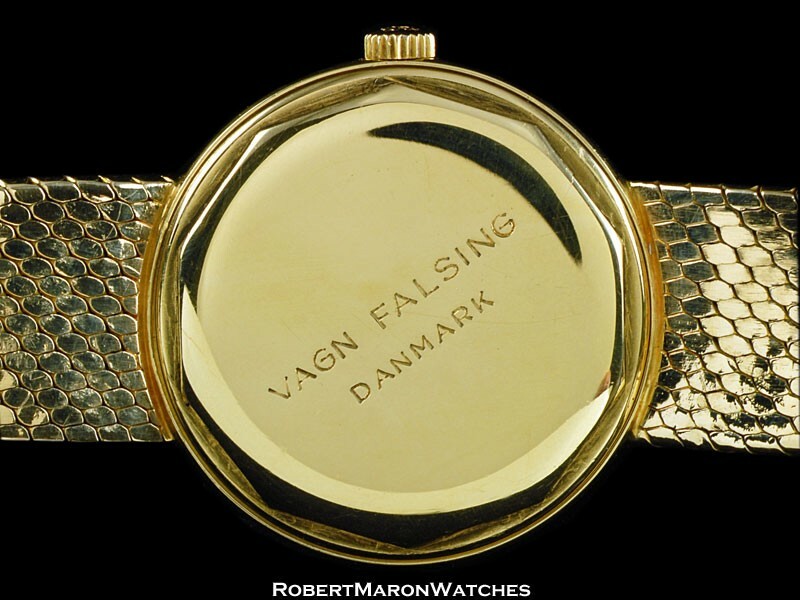 Case back is engraved VAGN FALSING DANMARK. The significance of the screw down case back is that this was Patek’s first concerted (and successful) effort to provide a watch that was truly water, humidity and particle resistant. Original untouched and beautiful gold dial with radial sunburst brush finish and blackened baton markers and hands. Black subsidiary seconds hand and 5 second scale. Date window at 3 o’clock is framed in gold. The very edge of the dial has a subtle gold embossed minutes scale. Automatic winding Patek Philippe Caliber 27-460M, which is considered by many collectors to be Patek’s best automatic movement ever. Movement features 37 jewels, is adjusted in 5 positions and to heat, cold and isochronism, and stamped with the Geneva Seal. 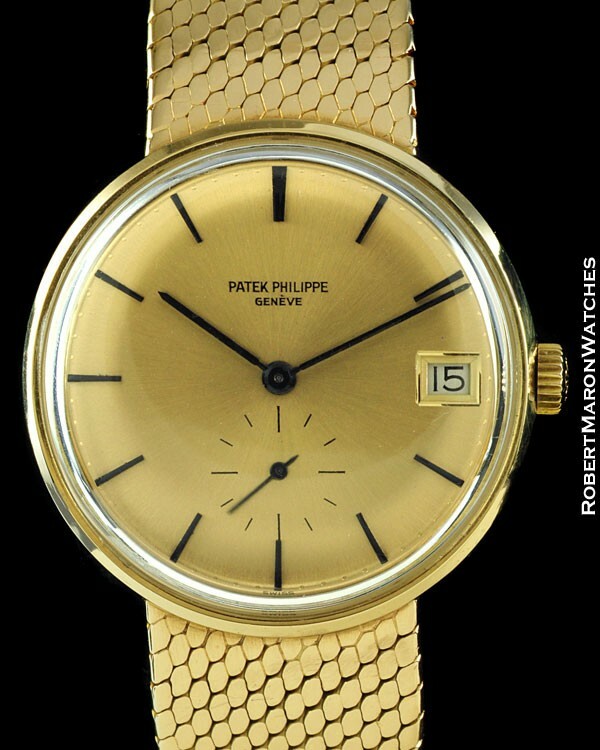 This is an outstanding vintage Patek Philippe Caltrava and is not only guaranteed 100% original but also guaranteed to put a big smile on its new owner’s face each time he or she sees it.